Previously: Three weeks ago, Broken Matt Hardy hosted Total Nonstop Deletion at the Hardy Compound in Cameron, NC. In the main event, The Broken Hardys retained the TNA tag titles in Tag Team Apocalypto. Tonight: It’s a New Year and another new beginning for Impact Wrestling. - Josh Mathews and The Pope kickoff Impact at ringside. They mention the new owners, Anthem Sports who have their logo on the middle turnbuckles and ring skirt. 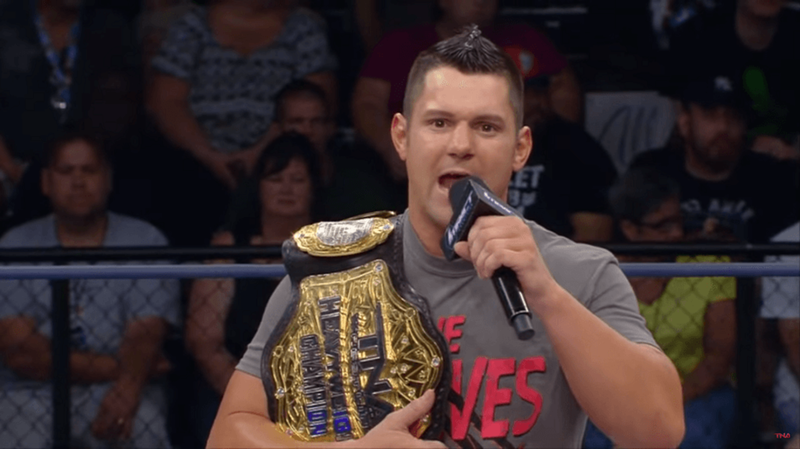 - TNA Champion Eddie Edwards enters the ring. He’s proud to usher in the New Year as world champion, and has a little surprise for the Impact Zone and the Wolves Nation but before he can reveal it, Bobby Lashley interrupts. Lashley wants a rematch for the title tonight and feels he was screwed over at Total Nonstop Deletion. EC3 comes down to the ring and he too wants his rematch tonight. Lashley and EC3 argue about who will get the title shot, but Edwards announces he’ll defend the championship against both in a triple threat in the main event. Edwards reminds everyone that he still has a surprise. - Backstage, the Broken Hardys, Reby and King Maxel arrive at the Impact Zone. They’ll be appearing on Fact of Life with Eli Drake later tonight. The Miracle controls the early part of the match and wins the first round by split decision. Moose is on fire right at the start of the second round. He hit a power bomb followed by a senton and then immediately hit a sweet looking moonsault off the second turnbuckle. Moose hit the game changer but the time ran out on the second round before he could score the win. Moose wins the second round on split decision. The last 30 seconds of the match was intense with both trading shots and moves. The time limit runs out so we go to the judges. Moose wins the third round on split decision and retains the title. - Backstage, Swoggle (formally WWE’s Hornswoggle) sees Vanguard 1 in the back. The Hardys approach Swoggle and asks if his father MeekMahan (McMahon) sent him to infiltrate the Hardy Compound. Swoggle told them that's not his real father. Spud complained about Swoggle not having his back in Tag Team Apocoplypto and challenges him to a match. Swoggle hit a spear, German suplex and Celtic cross to quickly win the match. After the match, Spud was furious that he lost and blamed the fans and company… so he quit. - In the back, an irate Mike Bennett challenged Moose to an Anything Goes Match tomorrow night on PPV. Eli warns EC3 that their feud isn’t over, but for tonight he’s going to focus on his guests The Broken Hardys. Eli was impressed with The Hardys retaining the tag titles in the compund match, but was mad he wasn’t invited. Matt said he invited everyone in space and time but Eli was scared like MeekMahan’s Day of New. Eli needed to have a personal invite. He and a partner of his choosing will challenge The Hardys for the tag championship on PPV tomorrow night. Trevor Lee and Andrew Everett took turns working over Crazy Steve. Abyss tagged in and dominated Everett and Lee. Helms tried to interfere, but Rosemary spit the green mist in his eyes. Abyss caught Everett with a choke slam to win the match. Suddenly, the lights go out and The DCC is in the ring. They break beer bottles on the back of the heads of Abyss and Steve. - Maria, Laurel Van Ness and Sienna are in the ring. Maria calls out Allie to the ring and blames her for all her problems in 2016. Maria challenges Allie to face Sienna and she accepts. Allie runs wild to start the match, but Sienna cuts off her momentum and takes over. Allie’s trainer/crush Braxton Sutter runs down to ringside to cheer her on. Allie made a comeback and slammed Sienna. Laurel forced herself on Sutter and he tried to push her off but it distracted Allie, which allowed Sienna to hit The Silencer to win the match. Post match, Sutter tried to check on Allie but Maria’s Lady Squad forced him away. - Josh and The Pope plug the One Night Only PPV Live tomorrow night. Edwards and EC3 work together to take out Lashley first. Lashley made a brief comeback, but EC3 and Edwards hit a double clothesline to send Lashley to the floor. EC3 and Edwards trade holds in the ring while preventing Lashley from entering. EC3 tries for a German suplex, but Edwards blocks until Lashley enters and German suplexes EC3 who gives Edwards a German suplex in the process. Lashley pulls the top and middle turnbuckles off, exposing the steel underneath. EC3 locked the sleeper on Edwards but Lashley hit a spear on Edwards that sent EC3 back first into the exposed turnbuckles. Lashley hit the spear on Edwards and grabbed the Word Championship belt. Edwards' surprise, Davey Richards, returned to TNA by grabbing the belt from Lashley, which allowed Eddie to hit the Boston Knee Party to retain the title. The fallout from tomorrow night's One Night Only Live PPV which will feature The Hardys defending the tag championship against Eli Drake & a mystery partner, Moose vs. Mike Bennett in an Anything Goes Match, Rosemary defending the Knockouts title againt Sienna, and the X Division title on the line in a four way.